Public service announcement to those who have ever suffered from hives, eczema, psoriasis, keratosis pilaris, "chicken skin", razor burn, or any type of rash-like bumps. And yes, 50% of the universe who have those incurable tiny red bumps on the back of their arms and legs, I'm talking to you! I myself have been suffering for years from those teeny rash-like bumps on the back of my arms called Keratosis Pilaris, or "chicken skin". I've tried every topical cream and home remedy, yet I still can't seem to grow out of this - and I'm sure you can't either. If you've seen my post last week about LUSH's Mask of Magnaminty, then you already know that was my first of many LUSH Cosmetics reviews. Please allow me to rave about how amazinggggg Buffy Body Butter truly is. "Tough on rough bottoms: Massage our Buffy body butter all over your wet skin in the bath or shower to make you softer and smooth to the touch, paying special attention to your backside. We add ground rice, almonds and beans to Buffy to act as exfoliants; the rough textures eliminate lumps and bumps and sloughs away dry skin cells to reveal brighter, fresher looking skin. Rinse off the exfoliating bits and pat yourself dry. There's no need for body lotion after a Buffy slaying session, because the cocoa and shea butters keep your skin beautifully smooth, moisturized and soft to the touch." description via LushUSA.com. Let me start by saying that this bar of soft scrub is no ordinary cleanser. Buffy is an exfoliant, smoother, cleanser, AND moisturizer all in one. Yes, moisturizer! 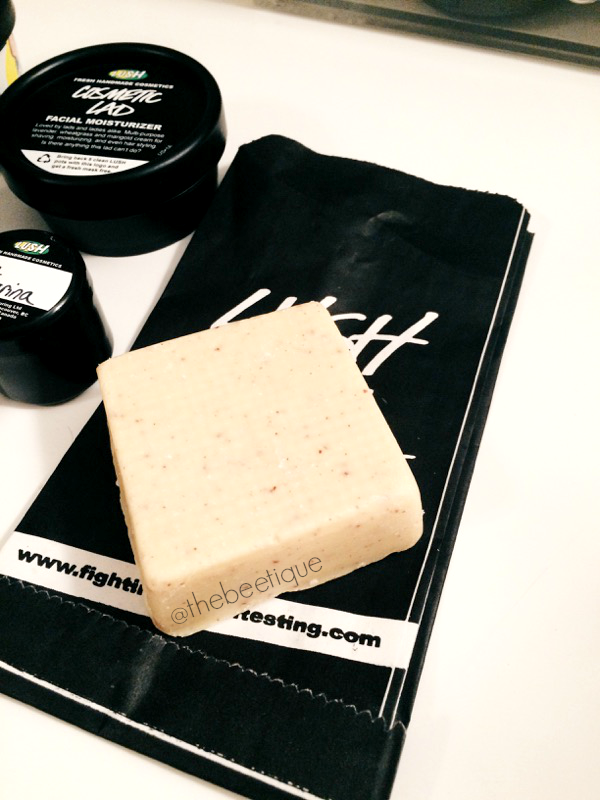 If you're not familiar with LUSH's Body Butter line, you'd be intrigued by what they do. I use Buffy three times a week only to the areas that need it the most. Since Buffy is a Body Butter, it tends to melt easily (even at body temperature), and therefore each Buffy bar is unfortunately short lived. 1) As the last step in the shower, I apply one side of Buffy to the back of my arms and legs in a circular motion. Although the feeling is a little rough, the ground almonds, rice, and beans will feel SO good. Especially on itchy areas. 2) Once I feel that the surface of my skin has enough product coverage, I put Buffy back in it's Body Butter Tin, ($3.95), or a Tupperware container will do, away from the steamy shower to prevent any melting / waste of product. 3) I then massage the butters and ground ingredients deeper into the surfaces of my skin. You'll notice an excess amount of product. While massaging, I then spread to other areas of my body. 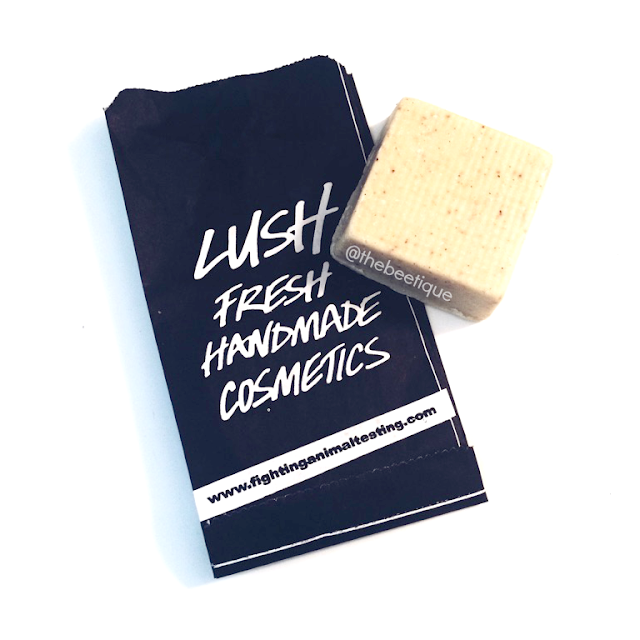 22 comments on "LUSH » Buffy for Bumpy Skin"
Never knew that Buffy was so good for KP! Thanks for the tip! I will have to try this! 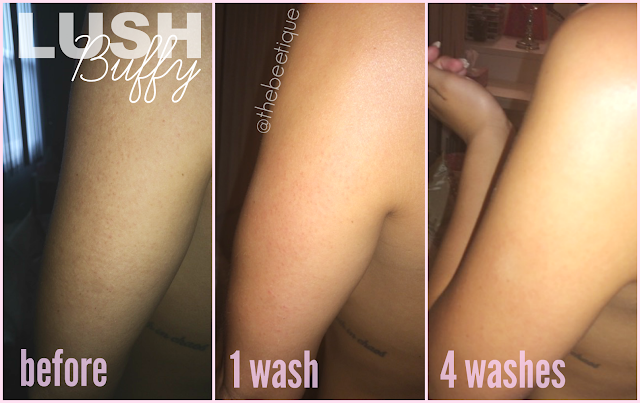 I struggle with Keratosis pilaris too on the back of my arms, tummy, back and legs. Good review! wow I can't believe the answer to my 30 year old KP has been under my nose!! Thank you!! I'm super self conscious about it! This product is life changing! Still haven't found anything like it :) goodbye KP! Do you use it before or after shaving? I normally exfoliate shave then moisturize but now I don't know! Hi Brittany , thank you for your article,it's very helpful, but from where i can order it ,i m from morocco? I have it everywhere and they are not little red bumps they are very noticeable!!! The major consequence of tissue expansion is the length of time needed to grow a sufficient amount of skin.Non-Surgical Face Lift Costa Rica This procedure can take as long as four months.